The colors of autumn are burnishing our garden, and though we are still ahead of a hard frost, I pulled out the eggplants, harvested the peppers and said a reluctant goodbye to my beautiful tomato plants, all of which haven't grown a whit since nighttime temperatures dipped in mid-September. The herbs are still chugging away, though, so we are still enjoying their enlivening presence in our supper cooking. The lemon balm has been particularly frisky and escaping its initial bounds, so I keep harvesting the runners and making up tea, now served hot instead of iced like the summer version. It's a member of the mint family (its cousin serves at the garnishing ring around the bowl in the photo), so I have to keep an eye on it or else it will propagate unfettered and take over its own garden empire. Lemon Balm is a perennial and benefits from frequent clipping of its somewhat shrubby stems to encourage new bright green leaves. It has an intensely lemony fragrance, though sometimes they veer toward the citronella end of the lemon olfacto-spectrum (maybe when the plant has started to go to seed, I haven't figured that out yet). Lemon Balm leaves are also covered with fine hairs, so I advise mincing or slicing them finely for use in recipes other than tea brewing. 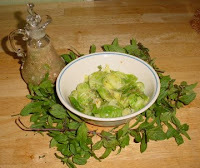 I had seen a recipe for Lemon Balm Vinaigrette somewhere in my Internet travels and that idea popped in my head as a dressing for cooked Brussels Sprouts. Dan and I always have a patch of these unfairly maligned vegetables to harvest from our Fall garden. We love them steamed with lemon butter, roasted with olive oil and herbs and now, in this new recipe, which has been added to our Brussels Sprouts repertoire. Wash sprouts and cut in half. If especially woody, cut out cores. Bring 5 cups lightly salted water to a boil in a medium sauce pot. Add Brussels Sprout halves and bring to boil again. Lower heat, cover and simmer 5-7 minutes. Sprouts should still be bright green, but crisp-tender. Brussels Sprouts, like cabbage and other cruciferous vegetables get limp and smelly when they are overcooked, hence their bad, though undeserved reputations. Drain and let sit while making vinaigrette. Mix all remaining ingredients together. Be sparing with the salt, as the mustard will no doubt already give this dressing a good bit of flavor. Dress warm sprouts with about 3 Tbsp. of the vinaigrette, saving the rest for your salads later in the week. Serves 4. We enjoyed this best hot, although the cold leftovers didn't survive past the next day's lunch either. I thought this recipe would be perfect for the Weekend Herb Blogging event which was started by Kalyn's Kitchen to explore the possibilities of cooking with herbs and unusual plant ingredients. This week it is hosted at Trembom, a food blog written by Valentina, a Brazilian-born British banker, whose recipes reflect many international origins. Check back with Trembom after Sunday to see a marvelous roundup. I love brussel sprouts and your recipe ooks like a new take on the usual 9Greek) lemon-olive oil. Is lemon balm the same as lemon verbena? Thank goodness for wikipedia, so I can answer your question quickly. Lemon Verbena and Lemon Balm are not the same plant, but they seem to both be shrubby, lemony-scented perennials. Lemon Verbena is a native of South America and has pointed, slender leaves and appears to be more cold-intolerant than Lemon Balm, which dies back but then returns after our Garden Zone 4 winters. Lemon Balm is a native of Europe and has rounded, oval leaves. I have never cooked with Lemon Verbena and can't recall seeing it in our garden stores, so I can't answer the question as to whether they would be interchangeable in this recipe, but perhaps someone is familiar with Lemon Verbena and could chime in. Hi Rachel, I love brussel sprouts and it is so lovely to find a new recipe here.Whenever I make them at home I am the only one to eat it up as my boyfriend does not like them at all.i believe that his mum never prepared them properly otherwise he would have developed a taste for them. I find that the mustard goes really well with them. I will most certainly prepare your recipe.Thank you. Nice use for brussels sprouts! That vinaigrette sounds fab. Hmm, I wish I knew if lemon balm was similar to lemon verbena, but I'm stumped. I did have lemon verbena in my garden once, but never used it much. This sounds good, I agree with Valentina that a touch of mustard is great with brussels sprouts. My lemon balm has eclipsed many a neighbouring plant. I had no idea before I put it in how aggressive it would be! Great idea to use it in a vinaigrette, usually I just make teas. Poached Pears in Rioja, Ghoulishly Good!